Seawind Catamarans are arriving on the Gulf Coast! Explore a Seawind 1260 while exploring Saint Petersburg! This amazing vessel will be available for you to visit first hand this Spring. Contact Richard Allen (see below) for details on the date, time and place. We will make arrangements for you to see the Seawind 1260... the first customer boat to arrive in the United States. This is a cruising catamaran specifically designed for serious blue water cruising. The Seawind 1260 represents 41 feet of the best ideas, engineering and craftsmanship accumulated over years by a team of expert builders. The 1260 is based on the prior Seawind 1250 with new upgrades and refinements. Indoor/outdoor, open lifestyle, with an unbeatable living area! The new 1260 features the same unique ventilation system as on our other models – combining ventilation in the cabins, the forward opening windows, and the tri-fold doors to draw air through the boat even in the most serene conditions. The Australian indoor/outdoor, open lifestyle is evident in this new design, with an unbeatable living area complimented with brilliant natural ventilation, protected cockpit lounge, and social helm seats putting the skipper in control as well as in the conversation. Best of all, you can enjoy what many cats compromise on… “visibility”‘ for the skipper AND crew, with 360 degree views from the helm and saloon seats all within the protection of the fiberglass coach-house and targa roof. We have an additional Seawind delivery coming to Pensacola, Florida! Explore a Seawind 1160 Lite while exploring Pensacola! In 2004 Seawind Catamarans launched the 38ft Seawind 1160… a ground-breaking, innovative design that gained worldwide acclaim for its clever layout and use of space, ergonomic design and efficient short-handed sailing performance. With well over 100 Seawind 1160s launched and sailing the world, the design is certainly well proven, from crossing the world’s largest oceans to chartering in the beautiful locations such as the Whitsundays, Thailand and Caribbean. Now with the Seawind and Corsair Marine design teams joining forces, a whole new approach is being taken to this classic design. The Seawind 1160 LITE features the same resin-infused construction and the same hull, deck, rig, sails with the famous Trifold door system of the previous 100 or so Seawind 1160s built. That said, the design team went back to the drawing board on how to streamline the design and ergonomics to offer a robust cruising cat at a very attractive price. One of the most noticeable differences onboard the Seawind 1160 LITE is the new sleek interior design and fit out. The timber kit is replaced with lightweight and stylish timber-look laminate surfaces, with a new contemporary neutral color palette as specified by Seawind’s interior stylist. The upholstery is modern, angular, yet practical with a range of hard wearing Sunbrella fabrics to choose from. The Seawind 1160 LITE also changes from the traditional diesel sail drives to lighter 20hp Honda (or 25hp Yamaha) outboard engines with electric tilt. Remarkable for ease of maintenance, and low-cost repair if ever required. The layout remains largely unchanged, though the suite on the starboard forward cabin is replaced with a practical walk-in wardrobe and wet locker. The galley is simplified with an upright fridge/freezer and 3 burner stove, but still offers the same amount of storage with ring lockers, a handy shelf and plenty of cupboard space – far MORE in fact than larger cats with galley-up designs. This amazing vessel will be available for you to see soon. Contact Richard Allen (see below) for details on the date, time and place. We would love to help make arrangements for you to see the Seawind 1160 Lite. 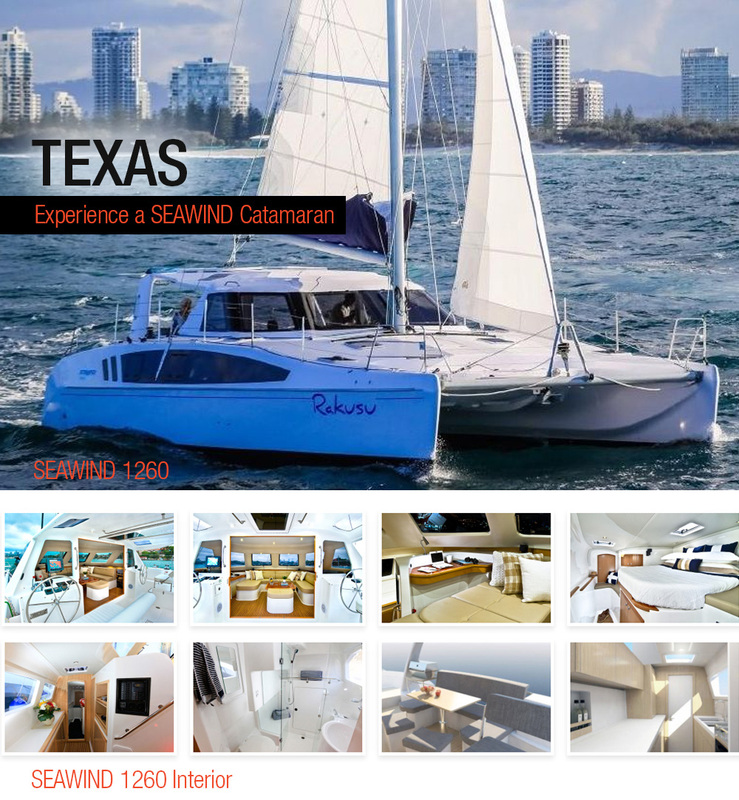 Contact either one of us to arrange a viewing on these Seawind Catamarans in the Gulf Coast.